You probably know Las Vegas as “Sin City,” and sure, you can still head there to hit the clubs, sidle up to a roulette wheel, or remind yourself why you stopped doing tequila shots. But in recent years, Vegas has become much more than just nightlife. In fact, what happens in Vegas doesn’t have to stay there anymore. 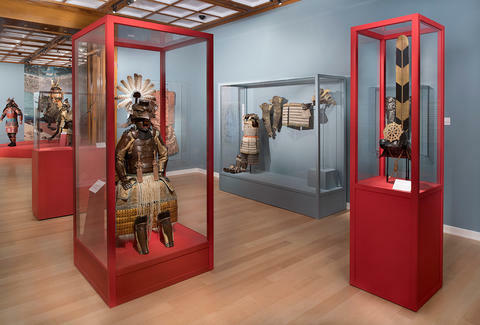 You can now take home a little culture and art education, and you can start at the incredible new Samurai: Armor from the Ann and Gabriel Barbier-Mueller Collection exhibit at the Bellagio Resort & Casino. The Bellagio already had one of the best sushi restaurants on the strip, but for a short time, you don’t have to let your hunger for Japanese culture end at sashimi. 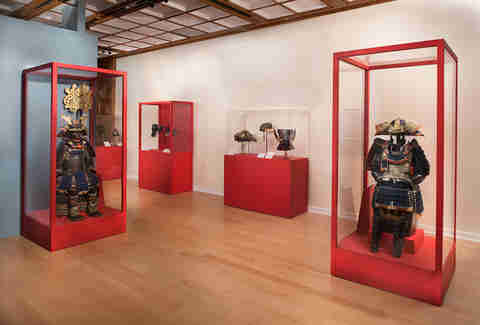 Head to the Bellagio Gallery of Fine Art until April 29, 2018 and you’ll have the opportunity to see a breathtaking exhibit of more than 50 pieces of samurai armor. Did you know that The Ann and Gabriel Barbier-Mueller Museum in Dallas, Texas was created to hold the Japanese armor collection owned by the Barbier-Mueller family? And since everything is bigger in Texas, the couple made sure to put together the largest private collection of samurai armor outside of Japan. Now, the museum is lending some of their fantastic pieces to be displayed at the Bellagio, including full suits, helmets, and weaponry. The samurai were the military nobility of early-modern Japan and are noted, among many things, for their impressive war tactics and battle technology, including the creation of a uniquely powerful and strong sword called the katana. 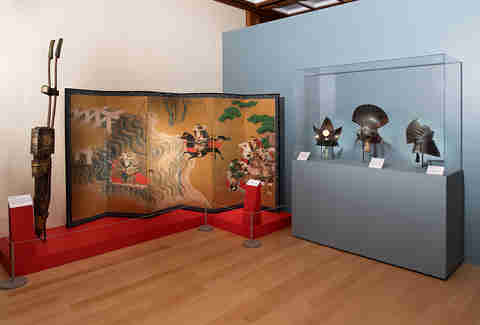 On display are pieces dating as far back as the 14th century -- it’s a walk through 600 years of history covering the evolution of the ruling class of Japan. 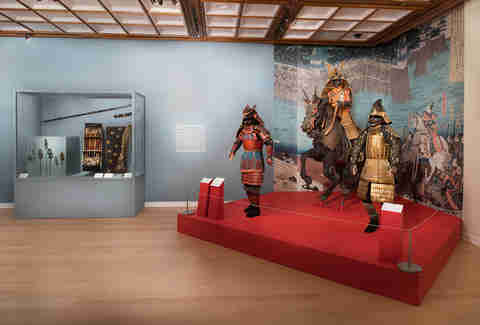 One of the first things you’ll notice as you’re exploring the Samurai exhibit has to be the incredible real-to-life-size horse and rider, fully decked in armor. It’s an awe-inspiring sight, and one that instantly allows your imagination to transport you to another place and time, far from the neon lights outside. You’ll also see full-sized battle-ready figures in exceptional red and gold armor, a stunning display. For those of us with some foreknowledge of samurai, one of the first images to come to mind is likely the impressive helmets the warriors wore. At the Samurai exhibit you’ll learn about the history of these magnificent protective pieces known as kabuto. Throughout the exhibit you can observe how they evolve in materials and aesthetic. They were traditionally made out of iron and crafted into unique shapes. Make sure to look out for the 15th century seashell, rhinoceros, and axe head shapes that made these helmets something truly spectacular. The suit of armor at the end of the collection was owned by a 16th century commander, but the focus here is not just the impressive attire. The ensemble is surrounded by fascinating objects and relics that he and his family owned, and that take you deeper into understanding these warriors and their lives. More of an animal lover? Horses were important to samurai warriors and this exhibit includes displays of the majestic armor worn by the steeds, as well. Samurai will be on display at the Bellagio Gallery of Fine Art at Bellagio Resort & Casino November 3, 2017 through April 29, 2018. The Gallery is open daily 10am -- 8pm. Last admissions are sold 30 minutes prior to closing. Want more information as you go through the exhibit? There are complimentary daily docent tours at 2pm, and private docent tours are available at an additional cost. Tickets to BGFA are $18 for adults; $16 for Nevada residents, seniors 65 and older, and students, teachers, and military with valid ID. Children 12 and younger are free. For groups of 10 or more, the gallery offers special pricing of $12 per person. For additional information, call (702) 693-7871 or (877) 957-9777, or visit bellagio.com/bgfa.